Madison improved to 2-1 this season. 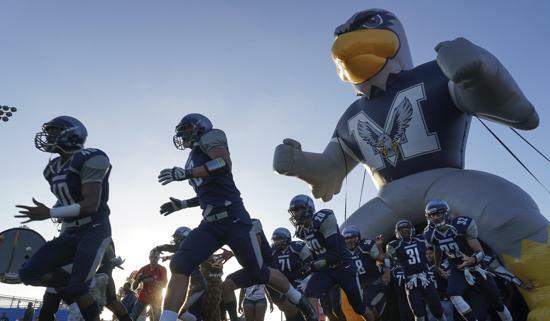 CHULA VISTA  Madison must look forward to seeing Bonita Vista on its schedule. The Warhawks outlasted the Barons, 35-21, in a nonleague game at Southwestern College on Friday, giving them six straight wins over Bonita Vista dating back to 2009. The Warhawks (2-1) have now won two straight after dropping their opener. Madison’s senior quarterback Terrell Carter threw for 149 yards and two scores – giving him eight TD passes for the season – on 15 of 26 passing. Senior running back Erick Buchanan led all rushers with 225 yards on 20 carries. The Barons (0-3), who won the San Diego Section Division III championship and advanced to the Division IV-AA state title game last season, have now lost as many games this year as they did all of last while dropping to 0-3 for the first time since 2010. Senior quarterback Anthony Posada completed 24 of 34 passes for 245 yards for the Barons, but Bonita Vista got very little ground, running for just 44 yards on 23 carries, and 31 of those yards came on one run. Madison took seven-point lead into the break. Junior Roland White fell on a fumble in the end zone to open the scoring, and Carter hit senior Erris King with a 13-yard scoring pass. Bonita Vista halved the deficit with a 15-yard scoring pass from senior Anthony Posada to senior Nick Esquivias with 24 second left in the half. Madison senior Kenan Christon restored the two-touchdown lead with an 8-yard scoring run in the third quarter, and Bonita Vista countered with a 10-yard, Posada-to-Josh Godfrey TD pass midway through the fourth.